On this page, you will find a brief summary of presentation and activity of the SNATED. This link will also allow you to learn more about GIPED : its missions and organization. On July 10th, 1989, the members of the French Parliament unanimously voted a bill on the prevention of the child abuse and on child protection. This law in turn gave rise to the Service National d’Accueil Téléphonique de l’Enfance Maltraitée (SNATEM : National Hotline Service for Maltreated Children). Since March, 1997, the service has a simplified, 3-digit number: 119. All premises receiving children are required by law to have this number prominently displayed. Calls made to 119 do not appear on the owner’s detailed phone bill. Its status as an emergency phone number (July 2003 decree) makes it available, toll-free, to everyone even from cell phones and overseas territories. The March 5, 2007 Law reforming child protection broadens the missions of the helpline. It becomes the Service National d’Accueil Téléphonique de l’Enfance en Danger (SNATED : National Hotline Service for Children in Danger), more commonly known as “119- Allô Enfance en Danger”. 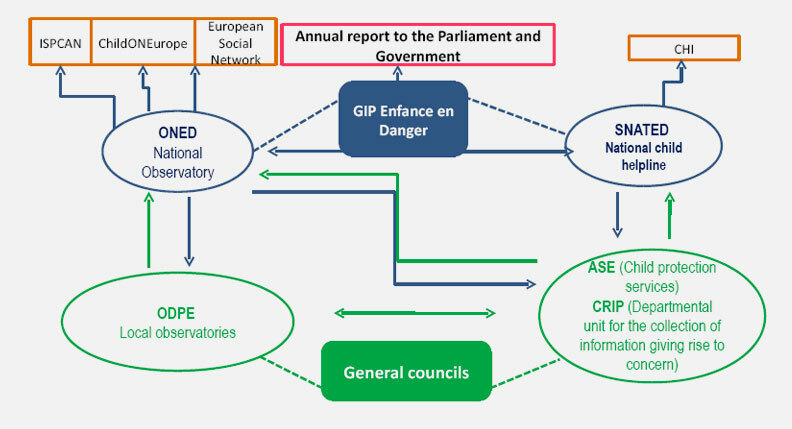 The legal framework of the service is a public interest grouping (GIP Enfance en danger, GIPED) that comprises three institutions directly concerned by prevention and child protection: the state, the departments, and child protection organisations. “119- Allô Enfance en Danger” is, in the field of French social helplines, the only service whose existence stems from a legislative decision, which confers it a number of legal obligations. Half of its funding comes from the state, and half comes from the departments. A technical committee of specialists assists the service. To listen to, assist, inform and advise via telephone any person confronted with a situation where a child is in danger or at risk to become so, especially when the calls are from the children themselves, so as to identify these situations and facilitate the protection of minors in danger. A transmission mission: To transmit any information giving rise to concern regarding these children to the departments - based relevant services, to whit the “cellules de recueil des informations préoccupantes” (CRIP). Each day, on average, 1 667 calls to 119 are picked up and nearly 91 are answered by the listeners. Their task involves listening, orienting, providing information and in some cases transmitting information to the relevant department-based services. Each phone call combines three levels of intervention. A team of telephone services professionals is in charge of pre-screening calls. Their mission is to take the calls, to inform the callers about the service and to dispatch explicit calls to the call centre. It comprises 45 professionals with complementary types of training: psychologists, lawyers, social workers. There are four main requirements for these professionals: being trained regarding care-giving relationships, being familiar with the pathologies linked to child abuse, understanding the institutional, administrative and judicial processes and knowing the department-based social network. Much of their activity consists in giving direct help to callers by listening to their immediate concerns, referring them to the relevant local structures, or by answering a request for specific information. A team of coordinators coaches the professionals at the pre-screening and call-centre levels. This team liaises between 119 and department-based social services. The coordinators supervise all information-sharing processes with the departments, validate the contents and organize follow-up procedures. They are in constant contact with their correspondents and the department-based social intervention structures. The President of the General council is responsible for the measures taken at département-level upon reception of the information sent by 119. In each département, the President of the General council names one professional to liaise with SNATED. As soon as information is received, the liaison officer gets the social services involved so as to assess situations following the guidelines established by the President of the General council. The assessment involves professionals from multiple fields: social workers, physicians from mother and child health centres (Protection maternelle et infantile, PMI), child care workers and psychologists reach a common diagnosis and agree on the most relevant response. Assessing the situations enables the professionals to define the help needed by the family. Different types of measures can be decided once they are validated by the département-based authorities: educational assistance, financial help, social and family economics consultations… The département may also refer to the judicial authorities. This happens for instance when the services cannot assess the situation, or when the family refuses to cooperate.